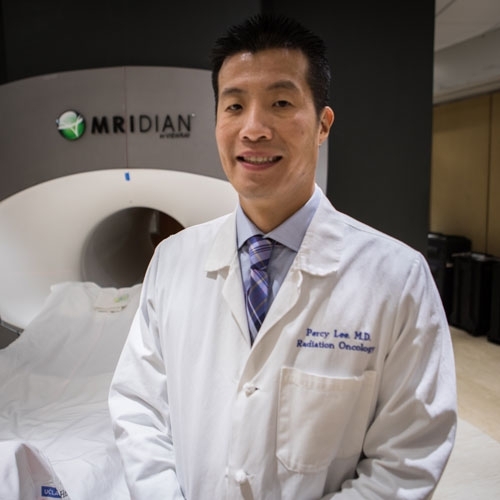 I think very few people understand what a radiation oncologist does,” says Dr. Percy Lee, an Associate Professor and Vice Chair of Education for the Department of Radiation Oncology at the David Geffen School of Medicine at UCLA, and current Clinical Director of the Stereotactic Body Radiation Therapy program. “We’re not radiologists, we use imaging to guide our treatment, but fundamentally we see patients, interact with them and care for them as an oncologist. Like how a surgeon uses their scalpel, radiation is our tool to eradicate and treat cancer. It’s incredible that technology has advanced to the point where we can have an MRI scanner as the radiation treatment machine with the ViewRay system. The advantage of this is that we can tailor the radiation while the patient is on the table. The goal is always to direct as much radiation to the cancer as possible, and minimize radiation to the normal, healthy tissue.